Raila Odinga, Kenyan opposition chief has withdrawn from October's 26th election re-run. He had made indications that he would do this immediately after the Supreme Court of Kenya Ruling that annulled the election of President Uhuru Kenyatta. Addressing the press on Tuesday, 10 October, Odinga said his withdrawal would give IEBC enough time to introduce reforms that will help deliver a more credible election. The Supreme Court had nullified the result of the original 8 August poll, which had led to the declaration of Uhuru Kenyatta as the winner. The Independent Electoral and Boundaries Commission (IEBC) announced that Mr. Kenyatta had won the August vote by a margin of 1.4 million votes - or 54% of the total, compared to Mr. Odinga's 44%. "We have come to the conclusion that there is no intention on the part of the IEBC [electoral commission] to undertake any changes to its operations and personnel... All indications are that the election scheduled for 26 October will be worse than the previous one." As a result, he said, "considering the interests of the people of Kenya, the region and the world at large" the best option he had was to withdraw from the race. 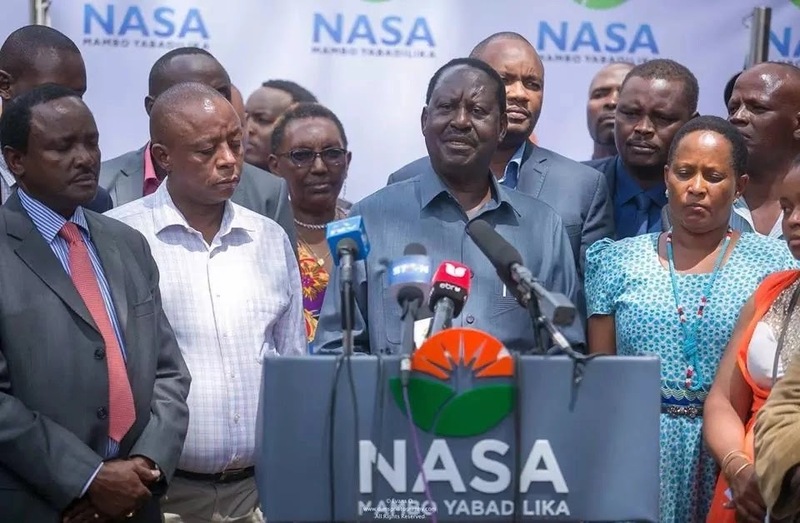 The opposition coalition, NASA trusts that the October 26 election will have to be canceled as a result of his withdrawal, which will allow "adequate time to undertake the reforms necessary to conduct an election that is in strict conformity with the constitution, the relevant laws, and the constitution". On the other hand, Mr. Kenyatta, who is still on the campaign trail, said: "We have no problem going back to elections. We are sure we will get more votes than the last time." He added: "We are also telling him it is the people's right to choose their leader. It is their sovereign right to choose their leader of choice." Mr. Kenyatta says he is ready to proceed with the new vote as planned. We at NASA have insisted that the fresh election ordered be held to the standard ordered by the Supreme Court, that is, in strict conformity with the Constitution and written law. We have provided a checklist of what we deem to be the “irreducible minimum” changes required to ensure compliance. The validity of the checklist of the requirements for free and fair elections proposed by NASA has not been disputed by anyone, not by the IEBC, not by Jubilee or other actors and observers. The EU Observer Mission recommendations are in conformity with our ‘irreducible minimum.” Instead, the case for proceeding with the fresh election on 26 October without these changes is being made on the grounds of time constraints. Jubilee and the other proponents of an election without reforms are saying “bora uchaguzi” (any election will do). But we in NASA are calling for “uchaguzi bora” (a credible election). ... the IEBC has stonewalled meaningful deliberations on the necessary reforms to ensure that the elections of 26th October are free and fair. It has wasted valuable time engaging in public relations exercises intended to create the illusion of motion without any movement. We have come to the conclusion that there is no intention on the part of the IEBC to undertake any changes to its operations and personnel to ensure that the “illegalities and irregularities” that led to the invalidation of the 8th August 2017 do not happen again. All indications are that the election scheduled for 26 October will be worse than the previous one. On its part, the Jubilee administration’s proposed amendment to the election laws demonstrates that it has no intention of competition on a level playing field. The only election Jubilee administration is interested in is one that it must win, even unlawfully. The State has in the period intervening the nullification of 8 August presidential election, gazettement good road network and infrastructure that it would take a short time for the Presiding Officers to travel to vantage points from where they would electronically transmit the results. The Commission had known the areas where the network is weak or totally lacking beforehand and should have made provision for alternative transmission. In one of its press briefings before the elections, the Commission had assured the country that it had carefully considered every conceivable eventuality regarding the issue of electronic transmission of the presidential election results and categorically stated that technology was not going to fail. The Commission had engaged three internet service providers to deal with any network challenges. The IEBC has refused, neglected or failed to put in place mechanisms to correct these illegalities and irregularities. We deem that the fresh election ordered by the Supreme Court cannot, therefore, be held. Allowing the candidature of Raila Amolo Odinga and Stephen Kalonzo Musyoka to lend credence to the election now scheduled is to participate in an illegality.